This Carrot Cake Recipe is so easy and full of flavour, that once you’ve made it once you want to keep making it. With this recipe, you will amaze your guests without wasting too much time in the kitchen. 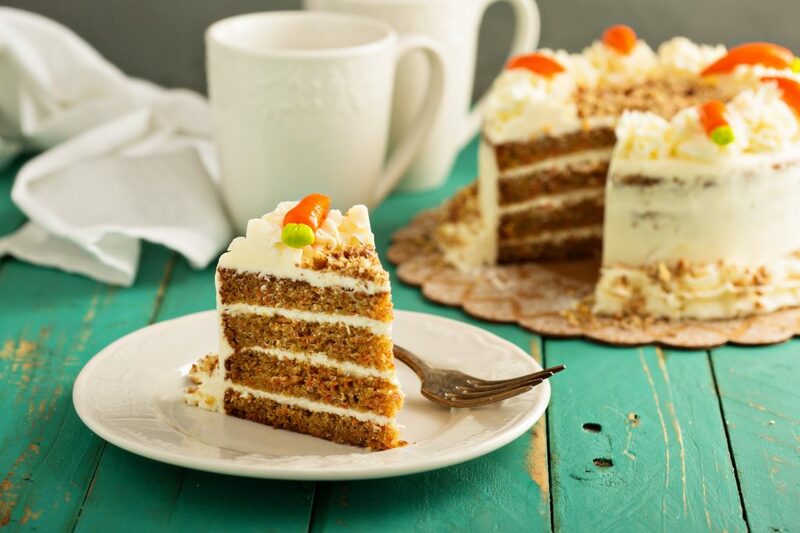 When it comes to carrot cake, it’s easy to think that it’s not an easy recipe (same happens with the Red Velvet Cake Recipe): in fact, on a first look, a carrot cake usually looks like extremely hard to make it at home. In reality, it’s quite a simple recipe, but it requires a bit of effort in mixing all the ingredients and make sure the cake itself won’t be dry and won’t be, at the same time, to moist. My carrot cake recipe is so easy, you don’t even need a mixer: just a couple of bowls, a spatula, a spoon and the ingredients. The method is really simple and quick: first, mix the dry ingredient in a bowl, then mix the wet ingredients together and then combine the two. At the end, stir in carrots without skimping on quantity. This batter is also really versatile: you can stir in nuts, dried fruits or just leave it as it is. It depends by your taste and also when you make it. 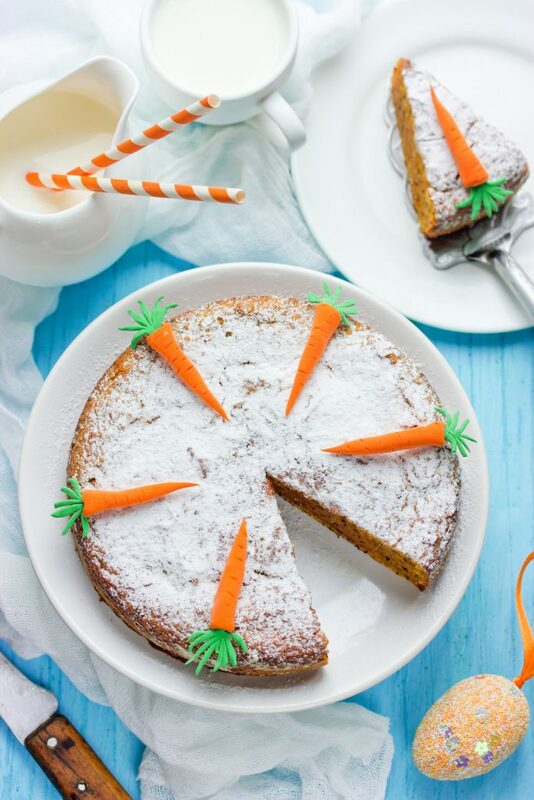 The traditional carrot cake recipe includes a layer of cream cheese frosting: it supposed to be mandatory to give a special kick to the cake, but if you want you can skip it, leave your cake as it is, sift a little bit of powdered sugar on top and eventually serve with some ice cream or whipped cream. The following recipe is to prepare a frosted layer cake: you can decide to bake the batter all together in a single pan to avoid the frosting and obtain a cake like the one you can see in the photo above. Add the grated carrots and the roughly chopped walnuts and mix well. Divide the batter between the 2 pans and bake in the oven for about 1 hour or until the surface is gold and if inserting a toothpick in the center of the cake it comes out completely dry. Cool cakes in pans for 10 minutes then turn out onto cooling racks, peel off parchment paper and cool completely. In a bowl, beat the softened butter with the cream cheese, the powdered sugar and the vanilla extract. Chill covered until ready to frost cake. When both the cakes are completely cool, frost the top of one cake layer with the cream cheese frosting and place the other cake layer on top. Decorate the top of the cake with remaining frosting or leave it as it is and decorate with walnuts, sugar paste or sugar. The carrot cake is perfect for Easter: decorate the surface with Easter themed sugar paste figurines such as rabbits, carrots and so on. You can make your own decorations by working with homemade sugar paste or buy yours. Prepare this cake together with these Easter Sugar Cookies and you won’t be disappointed. Sprinkle the surface of the cake with powdered sugar, plain or flavoured with cinnamon. Remember that if you put the cake into the fridge, the sugar will melt. You can also prolong your carrot cake’s life by wrapping it in plastic wrap and storing it in the refrigerator.